ENTRANCE HALL 6′ 3" x 3′ 9" (1.92m x 1.15m) With radiator, coved ceiling, power points and useful storage cupboard housing the Worchester wall mounted gas fired boiler, serving the domestic hot water and heating system. LOUNGE/DINER 19′ 7" x 10′ 2" (5.97m x 3.12m) With uPVC double glazed window, double panelled radiator, power points, coved ceiling and electric fire with ornate surround. KITCHEN 11′ 11" x 8′ 8" (3.65m x 2.66m) With a range of white fronted base cupboards and drawers with worktop surface over, one and a quarter single drainer stainless steel sink, mixer tap over, plumbing for automatic washing machine, built in electric oven and four ring gas hob with convector hood over. Wall mounted units, part tiled walls, power points, double panelled radiator, uPVC glazed door gives access to the side driveway. Inner hall with power point and loft access point. BEDROOM ONE 14′ 7" x 10′ 2" (4.47m x 3.12m) Presently used as a dining room. With radiator, power points, laminate flooring, uPVC double glazed patio doors giving an outlook and access to rear garden. 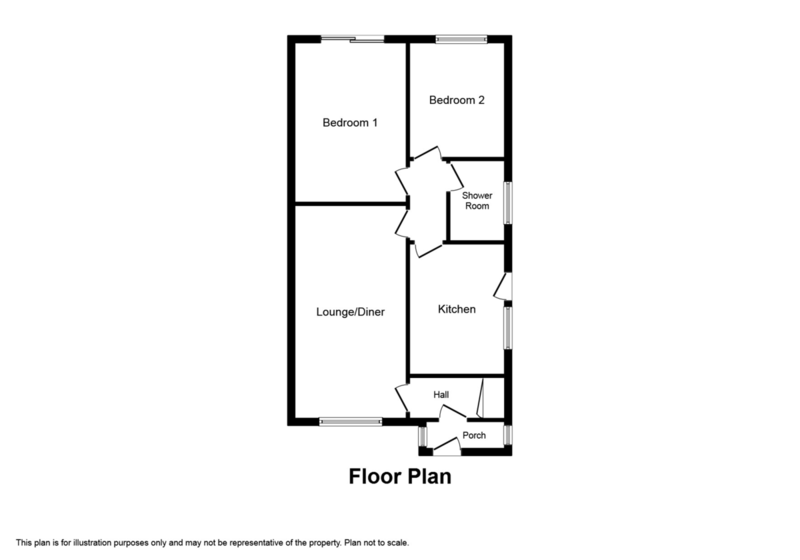 BEDROOM TWO 11′ 11" x 8′ 10" (3.64m x 2.70m) With radiator, uPVC double glazed window to rear elevation and power points. SHOWER ROOM 6′ 1" x 5′ 5" (1.86m x 1.66m) Having a shower cubicle housing a Mira Sport shower, pedestal wash hand basin, low flush w.c., radiator, obscure glazed window, fully tiled walls, tiled floor, inset spot lighting, extractor fan and shaver socket. OUTSIDE The property is approached over a concrete driveway providing off road parking with pathway leading to front entrance. The gardens to the front are low maintenance. Driveway leads to garage with up and over door, gate gives access to the rear. The rear gardens are a particular feature of the property having been landscaped with the use of paving and gravel for ease of maintenance with a good sized patio which enjoys a sunny aspect and bounded by timber fencing. SERVICES Mains electric, gas and drainage are believed available or connected to the property, with water by the way of a meter. All services and appliances are not tested by the Selling Agent. DIRECTIONS From the Prestatyn office turn left onto Meliden road and at the roundabout turn right onto Ffordd Pen Dyffryn and first left onto Ffordd Isa, take the second right onto St Andrews Drive , right onto St Georges Drive and first left onto St James Drive, turn left into the cul-de-sac and the property will be found on the left hand side by the way of a ‘For Sale’ sign.